Ontario Pathways is a linear rail trail. It forms a large “V” with a leg from Canandaigua to Stanley and another leg from Stanley to Phelps. Before reaching Phelps, it passes through the town of Orleans in what’s called the Wheat Road section. The linear trail now has a side loop. Doug Daniels spearheaded a group of volunteers to build the loop tril on land owned by Ontario Pathways between the rail trail and Flint Creek. The new trail is marked by white rectangular blazes. To find the new loop trail, head north on Ontario pathways. From the intersection where the Route 488 bypass (necessitated by the damage to the Route 488 bridge) rejoins the rail trail, look straight across to find the white blazes. The trail will lead down to and along Flint Creek, ending at a farmer’s lane, where you hike back up and rejoin the rail trail. Source: edited from article by Tim Wilbur in the OP newsletter. Tim didn’t mention the length of the new loop trail so if anyone knows, please add it as a comment. Both “Take Your Bike” guidebooks include Ontario Pathways. Join an Ontario Pathways trail crew one day or many – all work is appreciated. Sign up with the crew chief to get emailed the work locations or check the web site. Most work crews begin at 9AM. Trail work tasks include such things as adding top soil, installing signs, trimming brush, installing drainage, clearing trees, pouring concrete, and resurfacing the trail surface. All tools are supplied – you supply the labor. Ontario Pathways Trail is included in this Footprint Press guidebook. Sometimes its one step forward, two steps back. That’s how the folks at Ontario Pathways must have felt when they worked long and hard to get the bridge completed over Routes 5 & 20, finally connecting major segments of their trail. 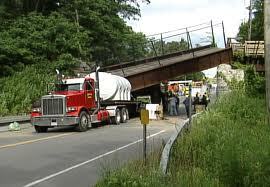 Then, before long a truck crashed & took the bridge out. Not to be set back for long, the OP volunteers again attacked the problem. A few more hurdles remain, but they think that by the end of June the New Flint Bridge will be completed, once again uniting Stanly to Phelps on the Ontario Pathways Trail. Ontario County’s communities demonstrated great vision years ago when they embarked on plans to redevelop abandoned railroad lines into paths for biking, walking and winter activities. In Victor and Farmington, the old Auburn Trail is a well-used path that connects Ontario County to one of the state’s largest trails: the Erie Canal path (editors note: this isn’t true). Conversely, bikers and hikers in Canandaigua can take the Ontario Pathways trail from the city and head for many miles into the country, traversing Hopewell, Seneca and even Phelps. But there is one problem: There is no connection from the Pathways in Canandaigua to the Auburn Trail, which ends at Mertensia Road in Farmington, a stretch of about seven miles. Leaders in the town and city of Canandaigua and Farmington want to change that. The three municipalities are in the initial stages of a study to connect these popular paths. They have created a committee representing respective governments and have hired a consultant, Fisher Associates, at a cost of $85,000 to forge a plan. Building a connecting path would give Ontario Pathways users access to one of the largest trail networks in the state, one that in theory could take them to downtown Rochester or even Buffalo. That connection could also open the door to the growing bike-tourism industry by allowing those on, say, the canal trail to head south and take in all that Ontario County has to offer. And it’s a win for county residents as well, by giving them a healthy and environmentally friendly alternative to motor vehicles. But the path to making this happen is not so clear. Some of the routes envisioned involve private land, meaning access — either through property easements or land sales — could take time to orchestrate. And then there is busy Route 332. At some point, the trail has to cross this major highway, either through the city or in the town. Possibilities include crossing at any number of traffic lights on the highway, although committee members aren’t sure that’s safe enough for walkers and bicyclists, especially children. But what about the possibility of going over or under Route 332? Pedestrian bridges and tunnels aren’t cheap, but they’re safe. And if the county wants to create a true alternative transportation network, the money spent would be worth it. If federal funding is available to create traffic roundabouts in Hopewell — not exactly the highest-traffic area in the county — why not money for a fly-over to allow safe access for hikers and bikers? Either way, the committee, comprised of authorities on everything from planning to recreation to the environment, appears to have the smarts needed to devise a plan, meaning that at some point the not-so-distant future, trail users in either Farmington or Canandaigua won’t find themselves at the end of the line. Safety issues are a major concern in connecting the Auburn and Ontario Pathways trails, residents said during a public meeting Wednesday night in Farmington Town Hall. Residents got an update from project managers with Fisher Associates during the public meeting, which included discussion and a chance for residents to express their views on the project. The goal is to fill a gap in the regional trail system by linking the existing Auburn Trail at Mertensia Road at County Road 41 in Farmington to the Ontario Pathways Trail in the city of Canandaigua. “In this day and age when people are getting out and are health-conscious, we want walkable communities. That is desirable,” said Roseann Schmid, senior project manager with Fisher Associates. A federal grant is paying the bulk of the $85,000 paid to Fisher to do a feasability study. The study is due to be completed in March 2012, after several trail options have been narrowed to one based on a number of factors and public input. “This is one of the largest federally funded feasiblity studies in the nine-county region. There are a number of issues to overcome and once we find solutions, we need to identify environmental impacts,” Ron Brand, Farmington’s director of development, said during a break in the meeting as residents reviewed options for the trial connection that would fill a gap that is roughly seven miles as the crow flies. This project, in its first step, is at a crucial juncture, said Brand. “The more support we get now,” he said, the more willing government entities will be later to put money toward the project. Challenges include obtaining permission to access private and agricultural lands and cross roadways that could involve the four-lane highway, Route 332, much of which has a 55 mph speed limit. Residents can views maps, offer input and obtain updates and meeting information at the Town of Farmington’s website — www.townoffarmingtonny.com — or may call Brand at (315) 986-8189. NIMBY (Not In My BackYard) lives loud and strong when it comes to building trails. Reading an Ithaca Journal article reminds me of the trials and tribulations Ontario Pathways went through to build their rail trail. Now the Ontario Pathways Trail is a gem of the community. The Caroline Trails and Natural Areas Committee should contact Ontario Pathways and learn from from their experience. Or maybe they need help from Parks & Trails New York. The Caroline Trails and Natural Areas Committee is trying to build a rail trail on the old Lackawanna rail bed from the end of the South Hill Recreation Way in Ithaca, through Caroline, to Owego.